Catch up on the nonprofit sector’s fundraising news for April! Find out about all of the activity, moves and updates within nonprofit organisations and philanthropy. Lise Taylor reports. Catch up on our April fundraising update! 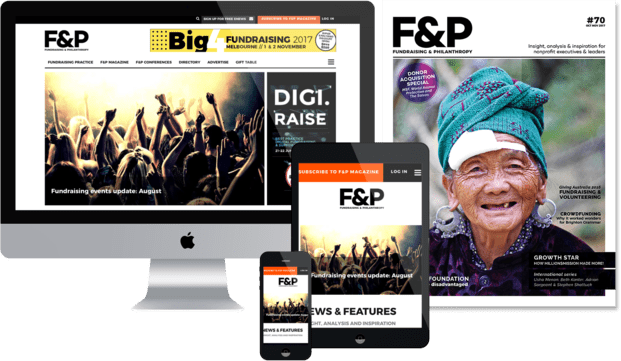 Find out all the activity, moves and news within fundraising and philanthropy. You are welcome to email Lise your news at [email protected]. If you’re based in New Zealand or just want an excuse to go there, don’t miss the Fundraising Institute of New Zealand Annual Conference. It is the premier learning event for fundraisers and charity and community sector leaders and those doing great things for good causes in New Zealand. It’s being held at the Rydges Lakeland Resort in Queenstown, with masterclasses on Wednesday 3 May and the two-day conference on Thursday and Friday 4 and 5 May with topics and sessions for every level of fundraiser and fundraising director. Keynote speakers include experts from the US, UK, Australia and New Zealand, including Michael Whitney (USA), Stephen George (UK) and Sommer Davies (Australia). See the full conference program here and register for the conference here. Within the current Australian context, anyone in the business of helping people – whether government, corporate, philanthropic or nonprofit, needs to be able to measure and demonstrate the impact of their socially-directed programs. The launch of the Australian Social Value Bank (ASVB) in mid 2017 is set to simplify this process, helping organisations assess their social impact in a resource-appropriate and proportionate way. For the first time, organisations will be able to compare the value of different interventions, so that they can decide where to focus their efforts. Developed for the Australian market by Alliance Social Enterprises and Simetrica, the ASVB is the largest collection of social impact values in Australia, and is the first of its kind to measure both primary and secondary benefits, with 60 values included in its first release. Founding Director of Simetrica, Daniel Fujiwara, will be in Melbourne, Canberra and Sydney from 26 April to 4 May to deliver the ASVB Social Impact Measurement (SIM) Training Series, providing an insight into the ASVB ahead of its release. Anyone interested in social impact measurement is invited to attend, and find out how they can use the tool to better measure and value their organisation’s social impact. For more information and bookings, visit https://www.trybooking.com/book/event?eid=265440. People working for not-for-profits and worthy causes will have the unique opportunity to learn how to marry online marketing and compelling stories together to raise funds, from some of the world’s leading change makers and entrepreneurs at Change the World, a FREE event taking place at The Entourage Development Centre in Sydney on Tuesday 9 May 2017 from 9am to 4.30pm. Change the World Sydney’s keynote speaker, entrepreneur and social media thought leader, Nick Bowditch, is the only person in the southern hemisphere to have worked for both Facebook and Twitter, and the only person in the world to work in marketing for both brands. Other speaks include Jack Delosa, the Founder and CEO of Australia’s largest and most disruptive education institution for entrepreneurs, The Entourage, and Rebecca Chua from Thankyou. Preventing harm and making a difference in the lives of those impacted by drugs and alcohol is no easy feat – it’s generally a labour of love, one that often goes unrecognised. “Harm from alcohol and other drug use is a major challenge in Australia, and far too often the people doing the work are not acknowledged or celebrated,” says Alcohol and Drug Foundation (ADF) CEO, John Rogerson. That’s why the ADF is encouraging individuals, groups and communities to nominate for the 2017 Alcohol and other Drug Excellence and Innovation Awards. “The Prime Minister’s award for instance recognises an individual who has made a significant contribution to reducing the negative effects of drug and alcohol use. But there are nine awards all up, and we see them all as equally important,” said Rogerson. Nominations can be submitted via email to [email protected] and close at midnight, 22 May 2017. The Alcohol and other Drug Excellence and Innovation Awards are supported by the Alcohol and Drug Foundation and the Australian Government. The awards ceremony will be held in Canberra, 16 June, 2017. Find out more information at adf.org.au/community/aod-awards/. Refugees who aspire to establish their own businesses in Australia now have the opportunity to do so with the support of not-for-profit organisation Thrive, which launched operations in New South Wales on 3 April. Thrive, which aims to expand to Victoria later this year, will offer microfinance loans and business support services to refugees, ultimately giving them business and banking credentials and records which they can then use to apply for commercial loans. Thrive Chairman and co-founder John Curtis AM said Thrive would fill a gap in the market for providing both financial and business mentoring support to refugees. Thrive CEO Mahir Momand, a microfinance expert and Afghan refugee, said refugees who come to Australia are well educated – at least 75% have graduated from secondary school and 35% have a graduate degree – and have a diverse range of skills. Thrive has partnered with Westpac which has provided $2 million to be used for microfinance loans and a COO to help establish Thrive as a stand-alone entity by developing all elements of its operations from credit policies to loan documents. Amidst a trend of declining employment of people with disabilities in Australia, one of the country’s foremost not-for-profit service providers has set a new standard by hiring 350 people with a ‘lived experience’ of a mental health issue. The target has been reached by Flourish Australia after three years of campaigning and targeted recruiting, aimed at people who identify as living with a mental health issue. The outcome is believed to be a first, in that no other organisation in Australia employs so many people with mental health issues. The 350 workers – half of Flourish Australia’s 700-strong workforce – are spread across many positions, from full-time executive management roles through to part-time support roles. A key to the outcome is the take-up rate of ‘peer-work’ positions at Flourish Australia, whereby people with a lived experience of a mental health issue are recruited and trained to support others on their recovery journeys. Flourish Australia’s ‘Why Not a Peer Worker?’ employment program has seen many people from all walks of life take up front-line mental health support roles. Flourish Australia said the employment result demonstrates that people with a mental health issue have the skills, knowledge and experience to contribute to any workplace, despite so often being neglected in the labour market. “We’ve actively sought people with a lived experience to take up roles with us and the response has been incredible,” Flourish Australia CEO Pamela Rutledge said. “Given that we’re a not-for-profit supporting people with mental health issues, it’s appropriate that people with a lived experience should make up at least half of our workforce. “We’re also showing that people with a mental health issue can fill positions across the spectrum of roles in any organisation and perform with distinction. We’ve had people with impeccable senior corporate experience and qualifications come forward, through to people looking for a career change and unemployed people looking for a job start. Flourish Australia Director and Psychiatrist Dr Josey Anderson said stable employment was extremely important to recovery when mental health issues are in play. “One in four people in any 12 month period will experience a mental health issue,” Anderson said. “Around 50% of the population will be managing a mental health issue at some stage in their lives. Stable and meaningful employment is vitally important for anyone on a recovery journey. “Unemployment can be disastrous and part of a downward mental health spiral, resulting in incalculable economic and social costs. A stable job gives all of us a sense of meaning, stability, participation and independence. Flourish Australia cited a recent Productivity Commission report showing that employment of people with disabilities in Australia is in decline. See pc.gov.au/research/ongoing/report-on-government-services/2017/community-services/services-for-people-with-disability/rogs-2017-volumef-chapter15.pdf. A two-day Give Backathon on 20-21 May 2017 will aim to provide tech solutions for four Indigenous charities at Brisbane City Council’s new innovation hub in Brisbane’s CBD. Give Backathon is Australia’s national charity Hackathon, which is the idea of Barayamal, an Indigenous nonprofit that runs an accelerator program for Indigenous startups. The event is a version of a ‘hackathon’, where participants typically work together to create software products, or improve existing products, in a limited period (maximum of a few days). Barayamal CEO, Dean Foley, said that the Give Backathon, as the name suggests, is a chance to give back to those who serve the community – in this case, Indigenous charities working tirelessly to improve the lives of Aboriginal and Torres Strait Islander people. “Indigenous charities have great potential to help close the gap; yet, they very often lack funding and technical skills. The Give Backathon will bring together approximately 70 IT professionals and enthusiasts who will use their valuable skills to ways in which the charities can make better use of technology,” Foley said. Foley said that while the Give Backathon will run for only two creativity-packed days, its impact will be long-lasting. “The tailor-made outcomes could, for example, enable the organisations to better connect with Indigenous communities or expand their range of platforms to offer programs,” he said. Sponsors of the event, KPMG, Microsoft and GitHub, will contribute towards prizes for participants to thank them for their time and efforts. People or organisations who are interested in supporting the free event can find more information on the Barayamal website. Australia’s largest enterprise software provider TechnologyOne (ASX:TNE) has announced an annual grant to Opportunity International Australia (Opportunity Australia), through the TechnologyOne Foundation, which looks to microfinance 500,000 children out of poverty over the next 15 years through an innovative entrepreneurial approach. The TechnologyOne Foundation is looking to break the poverty cycle for generations by supporting an innovative microfinancing approach to charitable giving through Opportunity Australia. “As a company that retains a start-up mindset and values the entrepreneurial spirit, we feel particularly well aligned to what Opportunity International Australia is trying to achieve,” Di Marco said. Opportunity CEO, Robert Dunn, warmly welcomed TechnologyOne’s decision. “Families from the poorest parts of the world will use the small loans provided by TechnologyOne’s generous gifts to undertake innovative entrepreneurial endeavours. All start-ups face similar issues such as limited access to capital. Small loans in combination with creativity, perseverance, determination and skills can enable families living in poverty to kick start and grow businesses,” Dunn said. In his board report at the Public Fundraising Regulatory Association (PFRA) AGM held on Wednesday 5 April, Chair John Burns was positive about its future. Since the PFRA’s formal board election two years ago, he announced the organisation was in a financially healthy position with a balanced budget and funds in reserve. Current membership is at 90, comprising 52 charities and 38 suppliers and representing a 50% increase over the last year. In addition, during 2016 300,000 people signed up to a monthly gift via member charities, which he said was roughly commensurate with 2015. The control check imperative “Face-to-face fundraising is an incredibly effective means of recruitment of regular givers but nonprofits are still operating in a very complex environment, which is why control checks are an essential part of PFRA’s work,” said Burns. He informed the audience that regular quality assurance checks and reporting back are conducted and, during 2016, 300 separate issues were resolved on behalf of members, such as poaching staff. There were 1.4 breaches at each check when these were first initiated and these have reduced to 0.8, which he says is an excellent result. In addition, most breaches were minor (think hidden ID badges) with only one or two recalcitrants. Road trips accounted for most serious issues. “These positive results also mean it can be demonstrably indicated to stakeholders that the PFRA’s ongoing measurement and conduct of street checks will assist in continuing to improve results and the level of positive engagement with charities,” he explained, adding that there are plans afoot to roll out training initiatives. Trust in the PFRA It was also noted that the PFRA now has a level of trust with eight local authorities across Sydney and Melbourne along with a database of 150 authorities. However, not having permits is the most common breach of the standard. “Although this is only an issue for a small number of members it does aggravate local government officers and endangers access for all,” said Burns. Fundraising engagement Employment can be a problem. Burns pointed out that all activity must be legal but consensus appears to be elusive because of the sector’s diversity. It was emphasised that the PFRA has no say in direct employment or sub-contracting arrangements – these are the charities’ responsibility. charities taking responsibility for the standards. “We are judged on the behaviour of the fundraisers on the street. These people are doing a difficult job and need the support of everybody involved in face-to-face to make sure they achieve those high standards,” he said. In his presentation, he provided an overview of the work the ACNC is doing with the states and territories to reduce red tape. Locke explained the ACNC knows this is a big concern with regard to fundraising and referred to that morning’s launch of the #FixFundraising campaign and its associated open letter from 156 charities to the governments of Australia to look at the ‘mess’ of fundraising legislation across the country. Locke also noted the recently published ACNC compliance report setting out the investigations and compliance work it has undertaken over the last two years and the ACNC’s approach to the sector – how it regulates and works with bodies such as PFRA and FIA. Barnardos Australia has paid tribute to the life and work of its long-time Chief Executive, Louise Voigt, who passed away peacefully at her Sydney home on Friday 7th April 2017. Voigt led Barnardos from 1983 to her retirement in 2015. She was a fearless advocate for children. She inspired the development of evidence-based practice and many of the approaches she pioneered are now standard across the child welfare sector. During her period of leadership at Barnardos she championed Children’s Family Centres to assist families at risk to stay together in times of crisis and prevent the premature removal of children. She was responsible for the care of thousands of children who could no longer safely stay with their families. She pioneered open adoption in Australia and oversaw the adoption of 246 young people. Louise had a strong sense of social justice for the most vulnerable in our community, especially Aboriginal and Torres Strait Islander people. This is the foundation of Barnardos’ commitment to delivering quality services to children, young people and their families. She received the NSW Association of Social Workers Social Justice Award and Lifetime Achievement awards from the Association of Child Welfare Agencies and the University of Sydney. A public memorial will take place in coming months. In lieu of flowers, those wishing to pay their respects can donate to continue Louise’s legacy through the work of Barnardos Australia. Donate at barnardos.org.au or 1800 663 441. When the FIA released the draft of a new National Code for the fundraising sector recently, it was agreed one area in need of reform was how fundraisers treat people in vulnerable circumstances. “The new Code makes a simple pledge: FIA members will not accept a donation where they have a reasonable belief that the donor is in vulnerable circumstances or lacks capacity to make a decision to donate,” says CEO Rob Edwards. “Members must now, when they come across such a person, take greater care to engage with such people respectfully and responsibly. “As our population ages and more people with chronic disease or other disabilities are enabled by modern medicine to live at home for longer, a greater onus of responsibility falls to fundraisers to demonstrate appropriate care and sensitivity. “To be clear, we are not saying that all people in vulnerable circumstances are off limits for all time. It may be that person, due to a temporary illness, could be vulnerable for a short period. “We acknowledge it isn’t always easy to identify a person in vulnerable circumstances. If an appeal is being made via telephone, the fundraiser’s ability to assess a person’s vulnerability could be limited. This is why FIA will be offering guidance and training to assist members in making good judgements. This guidance explains some of the common signs of vulnerability such as a lack of comprehension about what is being said, asking for statements to be repeated, or making statements that indicate others look after their financial affairs. FIA will hold a free webinar on 20 April for those seeking more information or wanting to provide feedback about the revised Code of Practice. Register here. How should fundraisers interact with people in vulnerable circumstances? Provide the person with relevant information and options for donating later so they can consider their decision in their own time. Five hundred and ninety charities have had their registration with the Australian Charities and Not-for-profits Commission (ACNC) revoked, after failing to submit their annual reports two years running. In February 2017, ACNC Commissioner Susan Pascoe AM warned more than 1,300 registered charities that failing to submit their outstanding Annual Information Statements would result in the loss of charity status. “As the national charity regulator, it is important that we provide the Australian community with accurate and up-to-date information on the Charity Register,” Pascoe said. “This information is largely collected from the Annual Information Statements required from charities to meet their basic requirements to retain charitable status. The organisations that have lost their charity status were warned multiple times to submit their outstanding reports. “Pleasingly, more than 700 charities – over 55% – that were initially at risk of revocation have recognised the importance of being accountable and transparent in their operations, and have submitted their outstanding statements. This group has retained their registration with the ACNC and will continue to access Commonwealth charity tax concessions. The remaining 590 charities that failed to submit their outstanding statements in the given timeframe have now been revoked. Charities that have been revoked will have this published on their Charity Register listing, and will no longer be able to display the ACNC’s Registered Charity Tick. Donors, grant-makers and volunteers can search the Charity Register at acnc.gov.au/findacharity. The list of revoked charities can be found at acnc.gov.au/doubledefaulters. Naomi Milgrom AO, Founder of the Naomi Milgrom Foundation, recently announced that MPavilion 2016, designed by award-winning Indian architect Bijoy Jain of Studio Mumbai, has been gifted to the people of Melbourne and will be relocated from its temporary site at the Queen Victoria Gardens to its new home at the Melbourne Zoo in Parkville. The relocation is underway with assistance from the City of Melbourne, Naomi Milgrom Foundation and Kane Constructions. “Bijoy Jain’s MPavilion is part of an international movement in handmade architecture encapsulating Jain’s ongoing interest in traditional craftsmanship and human connectedness. The Melbourne Zoo occupies a special place in the heart of Melburnians and I’m thrilled that this beautiful pavilion will continue to inspire people of all ages,” Milgrom said. 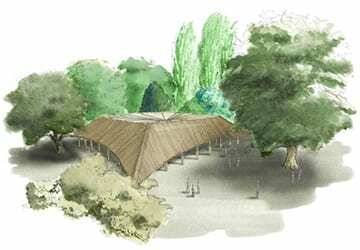 Lord Mayor Robert Doyle said the third MPavilion would provide a lasting cultural legacy for Melbourne. Work on the installation of MPavilion 2016 at the Melbourne Zoo site has begun. Melbourne Zoo Director Kevin Tanner said the MPavilion would be incorporated into new landscaping in existing open space just off the Main Drive between the heritage carousel and the Japanese Garden. MPavilion 2016’s program of talks, workshops and performances created in collaboration with more than 350 arts organisations, designers and architects from Melbourne and around the globe concluded in the Queen Victoria Gardens on 18 February 2017. Over four months, 94,000 people attended 487 free events in the temporary pavilion, which has become Australia’s leading architecture commission and design event initiated by the Naomi Milgrom Foundation with support from the City of Melbourne, the Victorian State Government through Creative Victoria and ANZ. As part of the foundation’s ‘Architecture in the City’ strategy, each previous MPavilion has been gifted to the city. MPavilion 2014, designed by Australian architect Sean Godsell, permanently resides in the gardens of the Hellenic Museum. MPavilion 2015, designed by British architect Amanda Levete of AL_A, is located at a park on Collins Street, Docklands. The commission for MPavilion 2017 has been awarded to Netherlands-based OMA and will be designed by Rem Koolhaas & David Gianotten. Amnesty International has announced that philanthropist and arts patron Judith Neilson AM will join the organisation’s prestigious Global Council. Judith Neilson, founder of the White Rabbit Gallery in Sydney, Australia, will be the first Australian to join the Council and joins the likes of Sir Richard Branson, world renowned Brazilian author Paulo Coelho, pioneering Japanese artist Yoko Ono, financier and philanthropist Krishna Rao, Founder and CEO of AirAsia Tony Fernandes, social activist Hadeel Ibrahim and entrepreneur Bassim Haidar. “As a visible driving force behind restoring the safety, dignity and hope of some of the world’s most vulnerable people, Judith Neilson’s voice will have tremendous strength as she brings it alongside Amnesty International,” said Salil Shetty, Secretary General of Amnesty International. Growing up in Zimbabwe and South Africa left Neilson with a deep awareness of poverty and the plight of refugees. Those concerns led to her work with Anti-Slavery Australia, of which she is Patron, and her endowment of a Chair in Architecture at the University of New South Wales to develop innovative housing for people displaced by war and natural disasters. Neilson’s charitable work and her contributions to the arts were recognised in 2016 with her appointment as a Member of the Order of Australia. Amnesty International’s Global Council was established in 2013 to support Amnesty’s work to advance justice and human rights globally. Members serve as champions for Amnesty International within their own networks and help the organisation’s Secretary General to raise financial resources and identify and engage new human rights supporters. Council members do this in a variety of ways that are suited to their backgrounds, areas of expertise and interests. The Funding Network (TFN) was honoured at the Philanthropy Australia Awards, taking out ‘Best Small Grant Award’ in recognition of its collaboration with nonprofit organisation Manjeri, to support its work in Uganda. The partnership began in 2014 when TFN, whose mission is to build the capacity of grassroots nonprofits by helping to democratise giving and facilitating greater community engagement, awarded Manjeri an initial grant of $17,900 to fund its work in Uganda, leveraging the power of social enterprise to build sustainable schools. Nicholas Harrington, Founding Director of Manjeri pitched at a TFN live crowdfunding event for support to start a taxi bus social enterprise. His compelling presentation raised the funds in just 10 minutes, thanks to the collective contributions of 40 individual donors and matched funding from the AMP Foundation. The winners of the 2017 Philanthropy Australia Awards were announced recently in Melbourne to recognise and celebrate recent extraordinary achievements in Australian philanthropy. Six awards were announced for categories including Leading Philanthropist, Best Large Grant, Best Small Grant, Environmental Philanthropy Award, Gender-Wise Philanthropy Award and Indigenous Philanthropy Award. Telco Together Foundation recently announced it will extend its pilot for giving donations via text message – Text Giving – through to 1 October 2017. To date, 15 of Australia’s charities including the Australian Red Cross, Cancer Council and Oxfam have successfully made use of the trial over the past 12 months and the Foundation is now looking to appoint another five charities. With mobile consumption and usage never higher, the simplicity of sending a text to donate means donors can give to their favourite charity in less than 10 seconds, with a $5 tax deductible donation charged to their mobile phone bill or showing up in their usage history (provided that PSMS is available on their service). Telco Together is a registered charity, launched in 2012 to create a united telecommunications industry effort to support Australian charities and people in need. Since launch of the pilot, participating charities have expressed enthusiasm about the potential for text giving in Australia, both as a new fundraising channel and as a donor acquisition tool in converting donors to regular giving. Charities interested in submitting an EOI should visit telcotogether.org/textgiving/howtoapply with submissions due before midnight Friday 5 May. For more information visit textgiving.org.au. Raise a Patch by Yates is a fun, healthy alternative to the usual junk food fundraiser options. A carry box of 25 vegie seed packets costs $40 to purchase and each packet sells for $4. That means a profit of $60 per carry box. A carry box of 50 seed packets costs $75 to purchase, making you a $125 profit when all the packets are sold. Find out more at fundraising.yates.com.au. David Eades has been appointed as chair of one of Queensland’s largest disability service providers, Multicap, following the retirement of Professor John McAuliffe AM who held the role for 10 years. Eades has been a Multicap Director for the past 12 years and is well known in property, housing, development and infrastructure circles. Michael Roche, the former executive leader of the Queensland Resources Council, has been appointed as a director of the not-for-profit organisation following the retirement of long-standing non-executive director Harry Carrick. Global Market Leader for Michael Hill Anna-Marie Shaw has also recently been appointed to the Board of Directors, while John Gallimore, consultant to legal firm Allens Linklaters and Chris Perkins, former Chief Financial Officer of Mater Misericordiae Limited continue as Directors. Eades said the appointments follow a restructure of the Board ahead of the introduction of the National Disability Insurance Scheme (NDIS), which was driving profound change throughout the disability sector. “Getting ahead of the game and having skills around the board table that are well matched to a succinct and well-defined corporate plan will lay the foundations for success with the very significant changes that NDIS will bring to the sector,” he said. Multicap Chief Executive Officer Joanne Jessop welcomed the new Board appointments. “We look forward to building strong working relationships with our new board to strengthen Multicap’s position as a leader in the Queensland disability sector and to drive the organisation’s transition to a different funding model over the next five years,” she said. A new partnership in Western Australia between Social Ventures Australia (SVA) and Dismantle will see $150,000 invested into engaging and mentoring at-risk youth back into employment and education pathways through BikeRescue – an innovative bike mechanic and therapeutic support program. Dismantle will be the second Western Australian venture in Social Ventures Australia’s Venture Philanthropy portfolio. SVA’s Venture Philanthropy services enable a community of engaged philanthropists to support high impact social ventures that improve the lives of people in need in Australia. SVA’s partnership with Dismantle will focus on scaling the BikeRescue program into regional communities where issues such as youth suicide, anti-social behaviour and disengagement from education and employment are more prevalent than in metro areas. SVA will be supporting Dismantle over a three-year partnership, providing funding, capacity building support and connections to pro bono partners to enable Dismantle to develop BikeRescue into a social franchise using a ‘train-the-trainer’ delivery model – supporting Dismantle to more effectively scale across regional WA. SVA has worked with 40 social ventures like Beacon Foundation, Ganbina, STREAT and AIME, and distributed more than $20 million to support their work, build capacity and develop high impact models. The focus areas include access to great education, pathways to fulfilling jobs, social and affordable housing, and working with First Australians. In WA, Marnin Studio was the first venture to join the portfolio. McGrath Foundation recently announced its CEO Petra Buchanan has stepped down from the breast cancer charity having successfully positioned the organisation for growth over the next decade. Buchanan’s key achievements included double digit revenue growth, increased donor funding, renewal of the Federal Government’s financial commitment, and refreshed branding. “We celebrated the first 10 years of the McGrath Foundation in 2015, and since then, under my leadership the charity has been set on a solid path for the next decade. Rebranding the McGrath Foundation is creating increased awareness, and revolutionising fundraising using digital technology is creating new revenue streams,” said Buchanan. John C Conde, AO Chairman said, “Petra has been the driver of our renewal over the last three years and we are very sad to lose her. During her tenure she has increased the financial performance of the organisation and significantly increased the placement of McGrath Breast Care Nurses in communities across the country to support families affected by breast cancer. “The Foundation’s revenue grew by 16% in financial year 2016/2017 placing 16 new McGrath Breast Care Nurses since 2014 compared to the not-for-profit industry growth average of 2%,” added Conde. Adelaide has surged ahead in the race to cure cystic fibrosis thanks to a massive grant from a private South Australian foundation. The $670,000 cheque from the Fay Fuller Foundation means Cure4CF can proceed with critically important animal testing ahead of its ultimate goal of human clinical trials. “For a number of years we have been following the work of the CF Airway Research Group and its pioneering methods and to have such world class scientists developing a gene therapy intervention here in South Australia is a wonderful story and one that we are keen to support,” said David Minns, Fay Fuller Foundation Chairman. The two year project will establish the world’s only cystic fibrosis rat colony with researchers testing the effectiveness of gene therapy on the lungs of rats with the disease. If the treatment is successful, it will be a global breakthrough in an illness that has baffled medical science for decades. The Black Swan State Theatre Company launched its new Production Fund at its sold out inaugural Philanthropy Gala Dinner on Thursday 16 March 2017. The success of the fund was assured when Andrew and Nicola Forrest’s Minderoo Foundation offered to match every donation made on the night by generous donors, including Angela Roberts, Tim Roberts Giving, Mimi and Willy Packer and Michelle and Tony Grist. “We are extremely grateful to the donors of the Production Fund and all our financial stakeholders that enable us to bring Black Swan’s vision to create theatre that matches the boldness and beauty of the state we live in to life,’’ Barnaba said. Amongst those in attendance on the evening was Black Swan’s Founder Janet Holmes à Court AC who spoke about the Black Swan’s 25 year history, including the many successful artists who had commenced their careers with the company and the staging of ground breaking productions such as Bran Nue Day. She added that this was a remarkable legacy, as was the 20th anniversary of the partnership with Rio Tinto, recognised as one of the state’s most enduring and successful Business Arts Partnerships. Since the formation of Action Group COUCH in 2006, Charles and Pip Woodward have been leading the campaign for better services for people living with cancer and their families in the Cairns region. Recently, their vision of a COUCH Wellbeing Centre in Cairns is one step closer to being achieved with the announcement of a $500,000 donation from Hand Heart Pocket the Charity of Freemasons Queensland towards this life-changing project. The COUCH Wellbeing Centre, is a proposed development for the Far North Queensland region which will deliver services that provide a holistic approach to cancer care with the primary goal of improving the quality of life for people living with cancer (and beyond) as well as their carers. “The COUCH Wellbeing Centre will be modelled on the successful Bloomhill Cancer Care Centre located on the Sunshine Coast which has been operating for 20 years. The COUCH Wellbeing Centre will be a great addition to the cancer facilities available for people affected by cancer in the Cairns region,” said Charles Woodward, Chairman Cairns COUCH Ltd.
Hand Heart Pocket CEO, Gary Mark, said that the decision to support this project was made in consultation with the Freemasons in the District, who helped to identify a deserving cause that Hand Heart Pocket could support and would benefit the people of Far North Queensland long into the future. “This Centre will be the first of its kind in Cairns and will without a doubt be an asset to the region. Hand Heart Pocket is proud to support this regional initiative that will help to empower people living with cancer and their families, improving their quality of life,” Mark said. The Woodward family, which also donated 2.1 hectares of land for the proposed Wellbeing Centre, is well known for its commitment to the development of the region, dating back over 100 years. Centacare Ballarat has announced the appointment of a new CEO. Tony Fitzgerald commenced as CEO with Centacare Catholic Diocese of Ballarat on 30 January 2017. He joins Centacare after a longstanding career working as the Managing Director of State Trustees Ltd and in various roles at the National Australia Bank. On 30 March 2017 The Foundation for Rural and Regional Renewal (FRRR) announced it had established a Repair-Restore-Renew Fund to support the medium to long-term recovery of rural and regional areas affected by Cyclone Debbie and the resultant flooding. FRRR has supported communities affected by natural disasters since 2006. Working through a collaborative model, the Foundation raises funds at the time of disasters, which are then distributed through community grants beginning 12-18 months after the event. CEO Natalie Egleton, says this ensures resources are available to support communities when the needs have become more apparent. “This approach means that communities can take the time they need to conduct adequate research and planning to ensure that social and physical infrastructure is appropriate, sustainable and meets the future needs of the community. It means funds are available when the gaps are identified,” she explained. The Fund is tax deductible and accepts donations from individuals and from trusts, foundations, corporations and individuals. Donations may be made via FRRR’s website: frrr.org.au/donate. Australian Unity Trustees has appointed Caroline Whitby to the newly-created position of national manager – philanthropy. In the role, Whitby will be responsible for all the business’s philanthropic activities including managing relationships with trustees, working with not-for-profit organisations, overseeing grant programs, and handling the legislative and regulatory requirements. She has over 16 years experience within the financial services industry, including managing philanthropic programs at Perpetual Trustees and Trust Company. Whitby has a degree in sociology and legal studies from La Trobe University, is based in Melbourne and will report to Emma Sakellaris, general manager of Australian Unity Trustees.